Four bedroom villa with south-facing pool deck on Westridge – The Manors, a gated community with facilities including a clubhouse, gym, sports courts and play area for the kids, all conveniently located 20 minutes from the Disney parks! King-size bed, ceiling fan, door to pool deck, flatscreen TV, walk-in closet. En-suite bathroom contains a shower cubicle, sink unit, WC. Queen-size bed, ceiling fan, flatscreen TV, slide closet. Twin beds, ceiling fan, flatscreen TV, slide closet. Twin beds, Winnie-the-Pooh theme, ceiling fan, slide closet. Family bathroom next to Bedroom 3 and shared with the house contains a shower over bath, sink unit, WC. This four bedroom villa is a great place to begin your adventure in Florida! Its south-facing pool deck or games room would be a great location to spend some time with the family before heading out into Orlando to enjoy its ever-popular tourist attractions! The Disney parks are only a 20-minute drive away, with SeaWorld and Universal Studios both reachable in half an hour or less. The villa itself is in The Manors, a gated sub-community of Westridge in Davenport. Guests here can head to the clubhouse, or have a picnic in the designated areas, or for those who like to stay active there is a community pool, as well as a gym and sports courts. Once you have spent enough time out in the parks, travel along the US192, to the north of the community, to splash some holiday cash in the shops, bars and restaurants which cater to all tastes and budgets. Living Accommodation - The main living room is at the back of the villa and has sofa seating for five people around a wall-mounted flatscreen TV and patio doors to the pool deck. The kitchen with white appliances is next to the lounge and also has a breakfast bar for two people. Opposite the kitchen there is a dining table for four people which has windows overlooking the pool deck. The main dining area is at the front of the villa and can seat six. Bedrooms - The Master bedroom is at the back of the villa and contains a King-size bed, flatscreen TV, patio doors to the pool deck and an en-suite bathroom. Bedroom 2 is off the kitchen and has a Queen-size bed and wall-mounted flatscreen TV. Bedrooms 3 and 4 both have Twin beds and are next to each other down the hall from the Master bedroom. Bedroom 3 has a wall-mounted flatscreen TV and Bedroom 4 has been decorated with a Winnie-the-Pooh theme. Outdoor Living - The south-facing pool deck will be a great place to unwind after a long day in the parks! Here you could also enjoy an alfresco meal with the family on the table and chairs provided. Entertainment - For those with energy left to burn there is a carpeted games room where you can play as much pool or table football as you like! Some seating has also been provided so that eager spectators can cheer from the sidelines, or watch the wall-mounted flatscreen TV. Westridge Manors is a gated subdivision of Westridge, an established community on the US27. Community facilities here include swimming pool, gym and picnic area. 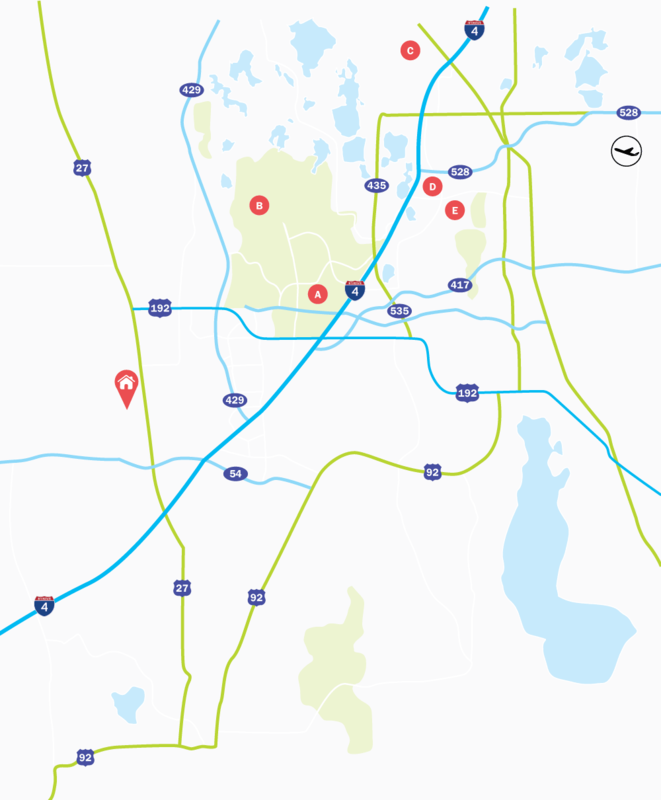 Shops and restaurants to suit everybody can either be found a few miles north on the popular US192, or head south a few miles to the Posner Park retail development. Disney theme parks are located less than 20 minutes away, with Universal, SeaWorld and International Drive all being less than 30 minutes drive away.